Obadiah Grudge is tall, dark, and ... gaunt, though he prefers the word rich. He dresses well and has a taste for the finer things, so it’s a good thing that the mysteries he writes consistently hit the top of the bestseller lists. The critics hate him; his public loves him. He’s got everything he wants. Then one day he gets a call. His estranged father is dead, and it’s time for the family funeral. While his mother, his father’s partner, and finally his father’s ghost work to convince Obadiah that he’s special, Obadiah is discovering that for himself. He barely escapes death by deranged killers, not all of whom are entirely human. Obadiah has inherited his father’s monster-killing business, his lunatic of a partner, and his pet Raven. It’s too bad he didn’t inherit his father’s skill. 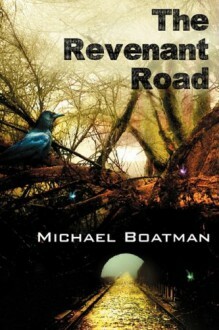 It seems Dad’s death has put Obadiah’s feet on The Revenant Road, and there’s no escape from that. Including the bonus story: “Neville and the Midnight Miracle Massacre” Neville, Grudge’s partner in the monster killing business, came by his mistrust of religion and his hatred of monsters early, but he’s never liked to talk about it. Then Neville disappears, and Obadiah finds he has to get nosy if he’s ever going to be the monster-killing partner his father was. I give this a little above a meh, mainly on the basis of style points. I tend to like these types of stories a bit darker and scarier. I read a ton of horror and this novel/novella didn’t really have anything that for me made it stand out from the lots of other similar stories out there.